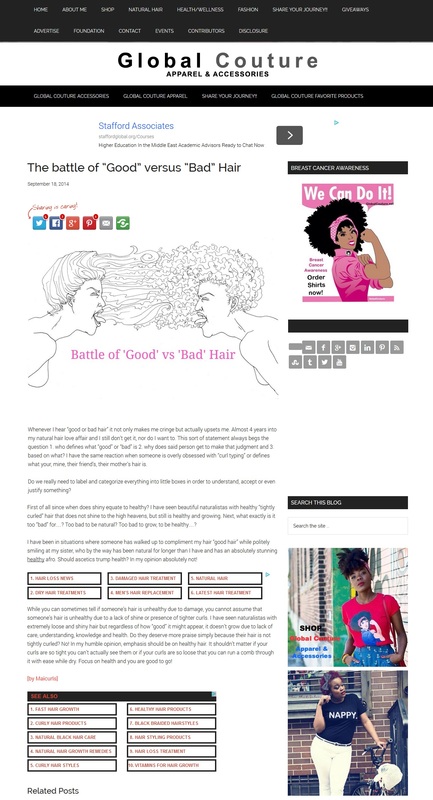 The battle of “Good” versus “Bad” hair is a “controversial” topic. Personal choices and preferences are something we all have and are entitled to. We can, do not and should not find all the exact same things attractive. Can you imagine if we did?! (The mayhem of fighting over partners that WE ALL find attractive…at the same time LOL)! Seriously…scary! When it comes to hair, some of us like volume, others like it “tame”, some of us like like long hair, others prefer short, some of us like light hair others prefer dark…you get the picture. However, when it comes to “categorizing” something as “good” or “bad” – that is a whole different game in my opinion. I have previously mentioned that this topic and the classification of “curl types” gives me an allergic reaction, especially when it is used to put someone down! I find ALL curls beautiful, I do not care how tight or loose your curls might be, what color your hair is or how long or short it might be. HEALTHY HAIR is what people should focus, obsess and strive for – regardless of whether you have a TWA or hip length hair. Have you ever been in a situation where someone made comments about “good” or “bad” hair? This entry was posted in Global Couture and tagged "Good" versus "Bad" Hair, Global Couture, Hair typing, Healthy Hair, Healthy Natural Hair, natural hair on September 25, 2014 by Maicurls. Indeed I have, for me good hair is healthy hair, done ☺thanks for the post dear, agreed!